Charlotte Georgina Trower (1855-1928) was the youngest of two brothers and one sister, Alice Trower (1853-1929). The Trowers were a wealthy Hertfordshire family whose estate, Stansteadbury (near Stanstead Abbotts), was taken on by the two spinster sisters when their eldest brother died in 1914. Both sisters were keenly interested in plants and Charlotte was a gifted botanical watercolourist. In April 1907, Alice wrote to George Claridge Druce (1850-1932), the most prominent amateur British botanist of the early 20th century, to request help in locating plants for Charlotte to paint: 'I shall be very grateful for any information that you can give me - every one who really cares for wild flowers is so kind in helping us'. These well-chosen words started a friendship and correspondence that would last until her death in 1929. Druce collaborated with Charlotte and Alice on the watercolours from 1907 and finally acquired the whole collection in 1928, which he, in turn, bequeathed to the University of Oxford in 1932. Charlotte Trower almost always worked, early in the morning, from fresh plants that she or her sister had collected from the wild, their garden or had been sent to them via their network of collaborators. Fresh material from their collaborators was sent in boxes via the postal service. Naturally, such treatment meant that some specimens arrived in a very poor state for painting, although Charlotte skilfully applied numerous techniques to revive the plants ranging from water, a darkened room to a dose of spirit. Trower Main Collection: general botanical watercolours and the most significant part of the collection. 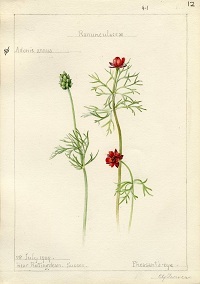 There are 1817 illustrations in the Trower Main Collection; all are watercolours except for one, which is a pencil drawing based on a herbarium specimen. Each painting was annotated in pencil with details that date and locality. After Druce acquired the paintings in 1928 he made additional annotations (in black or red ink) in his usual scruffy hand. The earliest painting is of Alder and the last painting was of the sedge 'Carex oxoniensis'. Most paintings have year dates; about one quarter were made before the Trower sisters had their first contact with Druce. There were two distinct periods of artistic activity: 1904-1917 and 1921-1928. Excluding Alice's own contribution, 76 people contributed plants for Charlotte to paint. By far the greatest contribution was made by Druce (272 plants). The vast majority of plants are from Britain and the Channel Islands (1747) and 47 are from the island of Ireland. 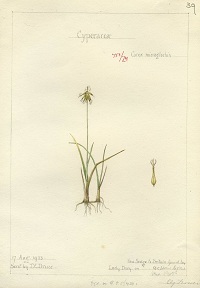 Approximately 1400 taxa are represented in the collection although the collection is biased towards sedges (220 watercolours), daisies (160 watercolours) and beans (101 watercolours). Only two grasses are represented. 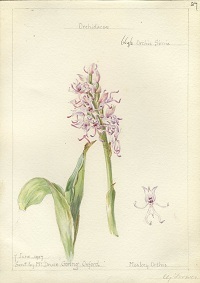 Trower was awarded the RHS's Grenfell Medal for her sedge watercolours. Trower Bramble Collection: The second element is the collection of bramble illustrations, which comprises 38 watercolours and black ink drawings of British representatives of the genus Rubus. Unlike the watercolours in the Main Collection, the brambles were illustrated on either heavy-duty white card or white paper. Each painting or line drawing was annotated in pencil with the following: scientific name, collection location and date. The bramble illustrations are part of an aborted project Druce devised to focus Charlotte Trower's talents for botanical painting. Trower collaborated on this project with the leading early 20th century batologist, Reverend William Moyle Rogers (1835-1920). Trower was awarded a Grenfell Silver-gilt medal for these illustrations. Trower Druce Illustrations: There are nine illustrations and these were commissioned by Druce. All but two are found in the Main Collection. 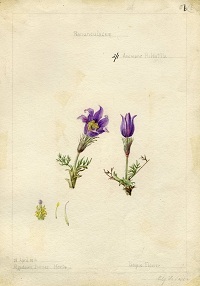 Harris, S.A. (2010) The Trower collection: Botanical watercolours of an Edwardian lady. Journal of the History of Collections 22: 115-128. Please note that these data may only be used for scientific purposes. They may not be sold or used for commercial purposes. For further information, contact Stephen Harris, Curator of the Oxford University Herbaria. The specimens at the Oxford herbaria and the living collections of the Oxford Botanic Garden are being digitized using BRAHMS and published online using BRAHMS WebConnect.